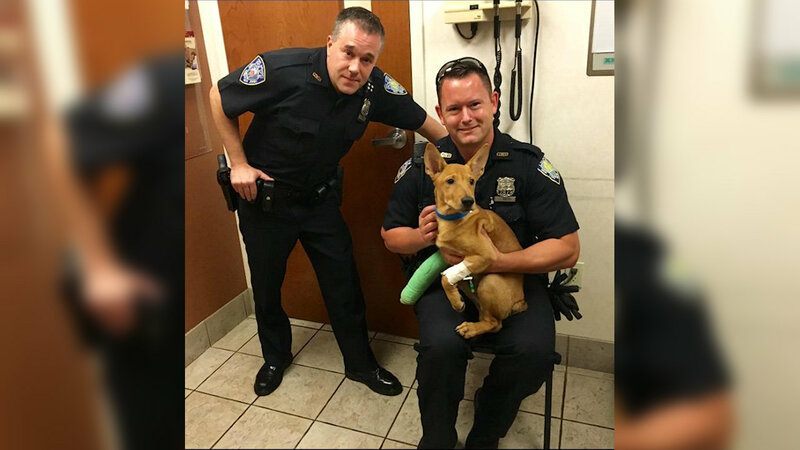 NEW YORK (WABC) -- When Port Authority police officers found Ronin, a six-month-old male puppy, under a truck, he was bleeding heavily from his front paw and leg. Earlier that day, September 10, Ronin had wriggled out of his collar during a walk and fled, then managed to find his way onto the New York bound lanes of the George Washington Bridge. Fortunately, Officers Fred Corrubia and Jonathan Harder reacted quickly. They sped Ronin to their personal veterinarian, Oradell Animal Hospital in Paramus, New Jersey, where the pup received emergency medical treatment. Meanwhile, Ronin's owner, from Washington Heights, Manhattan, were frantically searching for him. "We were beside ourselves," said the owner. "We stayed out all night putting up missing posters and searching the neighborhood for him." At around 3 p.m. Saturday, the owner called Port Authority Police to ask about Ronin. Officer Corrubia contacted the animal hospital, and soon the family was reunited. According to the owner, Ronin is recovering and just paid his final checkup visit to the vet. "Now he's rolling around in style in his wheelchair," said the owner. In honor of Ronin's safe return, his owners gave him a new middle name: Lucky George.